EcoNorth > EcoBlog > Aboriculture > We Offer A Tree Climbing Service for Bats! Here at EcoNorth we believe in developing our team’s skill set and broadening the services that we can offer to our clients. Our team members, Maria and Krzysztof, were very busy throughout 2017 and were overjoyed to have achieved their CS38 Tree Climbing and Aerial Rescue Level 2 certifications. EcoNorth is pleased to be able to offer a tree climbing service by bat licensed Ecologists. 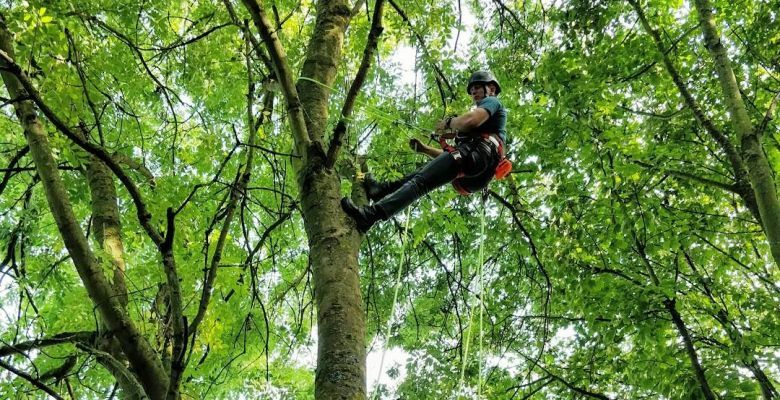 Tree climbing, also known as aerial inspections, provide an effective method of inspecting potential roost features up close and allow a more robust assessment which is often not possible from the ground. Additionally, features that appear suitable from the ground (using binoculars and/or torches) often turn out to be unsuitable upon closer inspection, for example, rot holes may be shallow or, due to their angle, collect rainwater. Inspections or surveys from the ground may be limited by leaf cover or ivy growth (often coinciding with the height of bat activity), resulting in difficulty in identifying exactly where bats have emerged from or returned to. Furthermore, if tree surveys for bat roost features are required during the hibernation period, traditional vantage point surveys provide few options due to the reduced or lack of activity by bats. By climbing and inspecting trees, we can reduce or remove the limitations of traditional methods, either by eliminating the requirement for ground based vantage point surveys or by undertaking surveys all year round , which can save clients both time and money.